Locals, including veterans (pictured top), gathered at Fremont Park today to commemorate the end of World War I 100 years ago today — and the 80th anniversary of the Park itself. 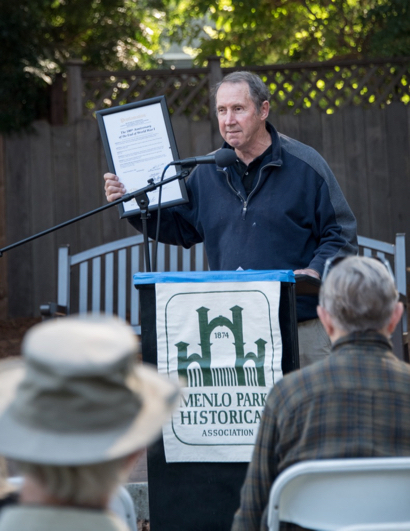 At the event, organized by the Menlo Park Historical Association, Bo Crane (pictured right) talked about how 20 years after the Armistice on Nov. 11, 1911, Fremont Memorial Park — the initial name —was dedicated by the City of Menlo Park. Explained Bo: “Jacob Frederick Carl Hagens, a San Francisco corporate executive in the 1930s, was key to the creation of the Camp Fremont Memorial Park at the corner of Santa Cruz Avenue and University Drive. “When he discovered that the vacant lot on the corner was to be used for commercial purposes, he tried to get the City to purchase the property. When the City failed to do so, Hagen formed a private group to buy the land, putting up most of the funds himself. 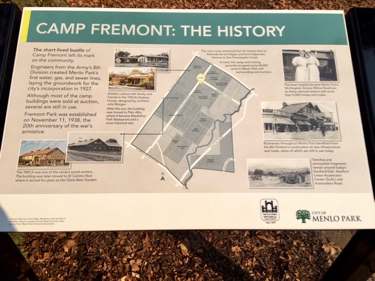 Also unveiled today are two new storyboards that tell the story of Camp Fremont in Menlo Park, which have been installed at the Park’s entrance. Just (4:00 pm) walked by Fremont Park. The hot weather – temps in the high 80s – apparently motivated a crowd of middle school students to gather there for some ball play and fun. The bunny ears gave it an Easter feel.